Just as appearances can be deceiving, so can taste buds be fooled. A case in point: apple maggot flies that fall for a biodegradable decoy baited with sugar and laced with insecticide. The people responsible for the taste bud trickery are Agricultural Research Service scientists and university and industry cooperators who designed the fatal attractions to be unattractive to many nontarget creatures. The scientists say similar decoys can be tailor-made for other insect pests closely related to the apple maggot fly. "In small and large orchards alike, we want apple maggots to get their just desserts in an environmentally friendlier way than they would with repeated spraying of trees," says Michael R. McGuire. He heads the Bioactive Agents Research Unit at the ARS National Center for Agricultural Utilization Research (NCAUR) in Peoria, Illinois. From time immemorial, apple maggot flies, Rhagoletis pomonella, have flitted among apple, pear, cherry, and other rose family species in the eastern and midwestern United States. If not controlled, apple maggot flies can inflict millions of dollars in damage to orchards. They feed on honeydew excreted by other insects and then lay eggs just beneath the apples' skins. Maggots hatch and feed, creating tunnels through the apples, which begin to decay and drop to the ground. In New England, apples on about 95 percent of unsprayed trees are typically damaged by apple maggots. Commercial growers usually control infestations by spraying the trees with a chemical insecticide about three times during the growing season, says Ronald J. Prokopy, an entomologist at the University of Massachusetts, Amherst. 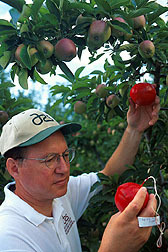 Controlling the pest with an insecticide-laced decoy would leave the apples free of insecticide. Prokopy found that the 1/4-inch-long, black-and-white-striped adult fly was beguiled by a decoy with suitable color, shape, size, and surface texture. Red is a favorite color, but the latest decoy versions are another favorite: black. Neither reflects ultraviolet light. Visually homing in on an apple decoy, the fly lands, and its feet detect the sweetness of sugar and sticky high-fructose corn syrup. While stuck on the sweet stuff, the fly eats a hearty fill of sugar—along with whatever insecticide is mixed in. Before Prokopy sought ARS collaboration, his decoys were red wooden spheres coated with a captivating sticky substance. Hung in trees, those spherical death traps worked well until they accumulated so many captured flies they lost their effectiveness. Weekly cleaning and recoating of decoys proved labor intensive. Then Prokopy modified the wooden decoys. He coated them with a concoction that included sugar and red latex paint, along with much smaller amounts of imidacloprid—an insecticide with low toxicity to mammals—than would normally be sprayed on trees. Those decoys worked well until heavy rains quickly washed much of the sugar away. That's where ARS scientists in Peoria came in. Funded partly by the Peoria-based Biotechnology Research and Development Corporation (BRDC), the researchers had developed expertise in producing starch formulations that controlled the rate of release of various substances. Coming up with a formulation with the right features for apple decoys involved working with BRDC chemist Baruch S. Shasha, formerly with ARS. ARS, BRDC, and the University of Massachusetts have been granted a patent on the improved biodegradable decoy. Its inside consists of table sugar, high-fructose corn syrup, water, corn flour, and sorbic acid, an anti-mold agent. Outside is a coating of sugar, latex enamel paint, and an insecticide such as imidacloprid. To prevent consumption by wildlife and other unintended victims, the researchers have include a hefty dose of hot cayenne pepper, which the apple maggot flies don't mind. Some of the feeding stimulant—the sugar—still rinses out with each rain, leaving microscopic pores in the paint. But as the soaked sphere dries, sugar from inside is drawn through the pores, recharging the surface. Recharging with the insecticide is not needed, since it's insoluble in water and little washes off. Preliminary field tests showed the decoys maintained 70 percent of their insect-killing power after 11 weeks in Massachusetts orchards. And in other tests, Prokopy and his colleagues found that once similar decoys were in place, they protected apples as well as three applications of the commonly used insecticide azinphosmethyl. Aware of the decoys' effectiveness in Massachusetts, Mark E. Whalon and Oscar E. Liburd, entomologists with Michigan State University at East Lansing, wanted to try them in Michigan orchards. They required 300 of them for placement about 27 feet apart. "We realized then that we soon needed to find a way to mass-produce them," says McGuire. 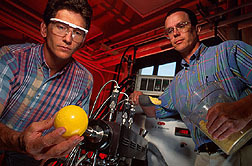 Chemical engineer J.L. Willet, who heads NCAUR's Plant Polymer Research Unit, began designing a continuous extrusion process to blend the formulation and make the decoys. To do this, he needed spherical stainless steel molds. But considering the fairly small numbers of spheres needed for the experiments, purchase of the molds would greatly drive up the cost per unit. Then, while at a local fast-food restaurant, NCAUR entomologist Robert W. Behle noticed hollow plastic balls in a children's area and acquired a few from the manager. The balls worked satisfactorily as molds. The researchers bought hundreds, filled them with the extruded formulation, cooled them, stripped away the plastic, and applied an outer coating of latex paint. Supplied with their 300 decoys in 1998, the scientists at Michigan State University, with colleagues at Kalamazoo College, Kalamazoo, Michigan, and the University of Massachusetts were ready to begin. Cooperators included the Michigan apple industry and growers of other fruits threatened by Tephritidae family relatives of the apple maggot. In the Michigan field tests, more than half the attracted apple maggot flies succumbed immediately, falling to sticky Plexiglas panes beneath the decoys—to be counted among the dead. Liburd concluded that most others became deathly ill. The evidence: Commercial monitoring traps just 2 meters away captured only about one-fifth as many flies as traps placed near decoys that lacked only insecticides. In other Michigan tests, blueberry maggot flies fell victim to insecticide-treated spheres painted green. This year, scientists called for thousands of the decoys, to continue research on blueberry and apple maggot flies and to begin experiments involving the walnut husk fly in California and the cherry fruit fly in Washington and Oregon. The test decoys were made by the Shady Corporation in Philo, Illinois, using a production process slightly modified by Jim Payne. Commercial manufacture and sale of the decoys containing pesticides registered for use in the United States would require approval by the U.S. Environmental Protection Agency. ARS is seeking an industrial cooperator to produce decoys for larger scale tests. A cooperative research and development agreement might entail temporary use of a company's scaled-up research equipment in a recently renovated NCAUR pilot plant.—By Ben Hardin, Agricultural Research Service Information Staff. This research is part of Crop and Commodity Pest Biology, Control, and Quarantine, an ARS National Program (#304) described on the World Wide Web at http://www.nps.ars.usda.gov/programs/cppvs.htm. Michael R. McGuire is in the USDA-ARS Bioactive Agents Research Unit, National Center for Agricultural Utilization Research, 1815 N. University St., Peoria, IL 61604; phone (309) 681-6595, fax (309) 681-6693. 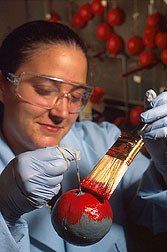 "Biodegradable Decoy Reduces Insecticide Use" was published in the January 2000 issue of Agricultural Research magazine.